A partition is a part or section of a hard disk, or, in other words, a storage space unit of the highest level on it. You can have only one partition, occupying 100% of your HD, or divide your hard disk into multiple partitions (each for a certain purpose), determine their size, install the operating and file system you want. 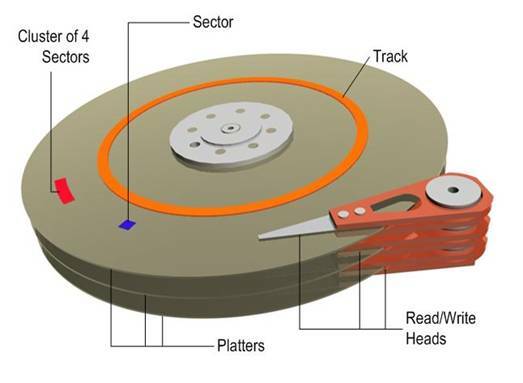 As a result, your single physical hard drive will turn into several smaller logical disks. Actually a hard disk can exist on your machine without any partitions on it, but it’ll be pointless because you won’t be able to implement even basic tasks, say, install an operating system and thus store and access your data properly. It need be added that you can install the majority of Windows OSes onto a non-partitioned disk - in this case the operating system will implement partitioning itself in the course of installation. Primary Partition is a partition that is needed to store and boot an operating system, though applications and user data can reside there as well, and what’s more, you can have a primary partition without any operating system on it. There can be up to a maximum of four primary partitions on a single hard disk, with only one of them set as active (see “Active partition”). Active (boot) partition is a primary partition that has an operating system installed on it. It is used for booting your machine. If you have a single primary partition, it is regarded as active. If you have more than one primary partition, only one of them is marked active (in a given PC session). Extended partition can be sub-divided into logical drives and is viewed as a container for logical drives, where data proper is located. An extended partition is not formatted or assigned a drive letter. The extended partition is used only for creating a desired number of logical partitions. Logical drive is created within an extended partition. A logical partition is a way to extend the initial limitation of four partitions. An extended partition can contain up to 24 logical partitions (you’re limited by the number of drive letters and the amount of hard drive space available for creating drives; of course, it’s senseless to use 24 partitions on a system in most cases, because it will be a data organization nightmare). Logical partitions are used for storing data mainly, they can be formatted and assigned drive letters; their details are listed in the extended partition’s table - EMBR (Extended Master Boot Record). There are 2 types of partition operations: basic and advanced. The former are more frequent, but you are likely to need to perform the latter ones either. So, let’s analyze both types. If a partition’s capacity is not sufficient for storing extra data on it, you might need to increase its space. The increase free space wizard will help you fulfill this task. In what cases do you move partitions? First, if you want to change the letter order assigned by the OS. Then in case you need to work with some older OS that can boot from binary partitions located at the beginning of the disk, you also perform this kind of operation. Speeding up partition operations and changing partition configuration are also implemented by means of moving partitions. You perform this operation when you create a partition backup or want to move all data from an old disk to a new one. After a partition is deleted, its space is added to unallocated disk space. It can be used for a new partition or to resize an existing partition. To securely wipe out data stored on the deleted partition use special partitioning tools, which include powerful hard disk/partition wiping utilities. You can split a partition in two or create an empty partition from another partition’s free space. You can merge two partitions, even if their file systems are different. All data will stay intact and reside on the resulting partition. You can explore and manage partition contents before configuring operations on that partition. The partition label is a name assigned to a partition for easier recognition, for example, “System”, “Data”, etc. To organize a file system that supports files and folders data storage, you must format a partition. Defragmentation is reorganizing file storage on a hard disk partition so that parts of files are not spread about the disk, which allows the red head to move less across the disk and thus, increases PC and server performance. Some operating systems assign letters to hard disk partitions at startup. Connecting an additional disk as well as creating or deleting a partition on existing disks might change your system configuration. As a result, some applications might stop working or user files might not be opened. To avoid this, you can change letters assigned by the operating system. Some file systems do not support large-sized partitions, files, or disks. They may also have a limited root size. To improve these characteristics you can use this particular feature. This option is necessary for protecting important information from unauthorized or casual access. Partition software usually allows you to hide both primary and logical partitions. This feature lets the operating system see the partition, assign a letter and provide access to its files. Since a hard disk can have only one active partition, the latter must be set. The FAT 16 partition is located in a special place and has a limited size. Advanced partitioning tools enable you to change the size of existing partitions. A file occupies at least one cluster (one unit of disk space allocation for files and directories). Smaller clusters reduce slack disk space. This operation is performed to change a hexadecimal value that defines the file and operating system suitable for a partition.